Spirometers. 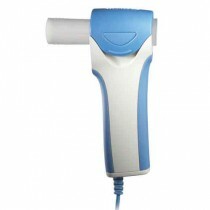 Incentive Spirometry BUY Incentive Spriometers, Incentives Spiromter. There are several things to consider when choosing the right spirometer for you, including the outcome you wish to achieve, resistance level, age of the user, term of use and comfort. 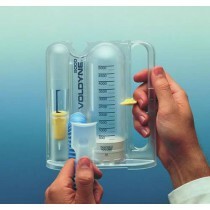 Spirometers are mainly used in two ways, either for short term use to assess the lung function of patients or longer term use to improve overall breathing strength and technique over regular, frequent use. They can be useful for pre or post-op patients, for athletes, or anyone wanting to increase lung capacity, lower heart rate, blood lactate and breathing rate. Different spirometers come with varying functions and range from disposable types for single-patient use to washable, reusable spirometers. Whatever your need may be, Vitality Medical offers a variety of spirometers for both youth and adults. 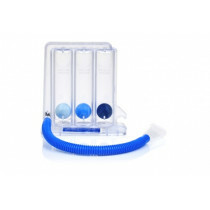 Therapy Based Spirometers: A therapy based Spirometer comes equipped with an indicator, such as a suspension ball or sliding incentive indicator that allows the user to monitor their progress and to encourage overall improvement. Some have tubing, a base and built-in handle. These are most useful for pre or post-op patients to improve rehabilitation results or for those who typically suffer from breathlessness and difficulty with physical activity. Athletic Based Spirometers: an athletic based Spirometer are reusable, washable and compact to keep with you during the day for frequent use. 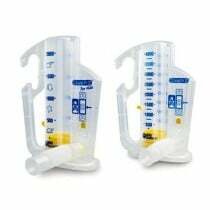 These spirometers are useful for athletes or those who are in good physical condition, but would like to increase lung capacity and maximize oxygen intake. 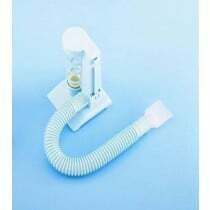 Low Resistance: a low resistance spirometer is ideal for pre or post-op patients who are looking to exercise the lungs or encourage deeper breathing and lung capacity. These spirometers are often equipped with incentive and progress indicators. Variable Resistance: some spirometers allow you to alter the resistance, for integral progress. High Resistance: a high resistance spirometer is ideal for athletes or for those who are in good physical condition, but would like to increase lung strength and capacity. Short-Term Use: For short-term use, single-patient, disposable, therapy based spirometers work well for patients to be able to keep with them and use for pre or post-op therapy. 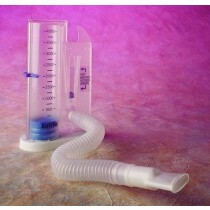 Long-Term Use: For long-term use, an athletic based spirometer can be handy to keep with you. These are more compact, washable and reusable. 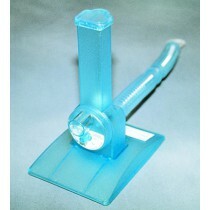 To maximize patient comfort, look for spirometers with flexible or resizable mouthpieces and built-in handgrips.